One of the most disturbing aspects of modern life are gift baskets. Never has such a shallow form of gift giving ever existed, with the possible exception of that period of our evolution when we threw poop at each other. I’ve never understood the concept. I once got a gift basket. I don’t remember who gave it to me. I actually tried eating the assorted cheeses and meats and crackers. But the stuff was bad, the cheese was a failed form of plastic, the meats were spiced filler, and the crackers were somehow worse than crackers. 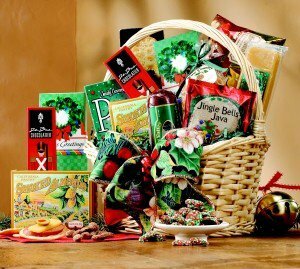 Giving a gift basket is such a grave sin in my book. It says all the wrong things: I’m cheap, I’m thoughtless, I hate puppies. So for you Tom, I think these will be perfect. In fact, I think I’ll give a basket to Tony G when I see him. If you’re not the embodiement of evil, then gift baskets won’t be for you. That’s alright, there’s still a chance to be cheap and tasteless with your gift giving. They’re called gag gifts, and they’re underutilized during the Christmas season (and overused at 40+ birthday parties). Things like giant underwear and oversized bras. Fake parking tickets. Remote controlled fart sound makers. Tasteless and insulting, these are the new gifts of modern man. Before, in kinder ages when the kindness of strangers meant life and death, man gave gifts worthy of recognition. Now that any schmo can survive the worst disasters and longest journeys, the need for kindness and connection are gone. You might as well alienate everyone you meet.